Indian Hindu weddings would witness the groom tying the mangal sutra or marriage necklace round his bride’s neck. The groom would be regally dressed and part of his accessories would be Indian bridal gents’ rings. His fingers would sport rings of various sizes and designs – sometimes very wealthy grooms would wear a ring on each finger including the thumb. Generally, the groom would wear a selection of rings on either hand. A Hindu wedding would not see an exchange of rings between the bride and the groom, like in Christian weddings. Hence gents’ rings are merely to accessorize the attire of the groom during the Indian Hindu wedding ceremony. Indian bridal gents’ rings are worn to embellish the entire persona of the groom. Thus his wedding ensemble would be incomplete without rings on his fingers. Indian weddings are lavish and spectacular and the groom is expected to portray a majestic and regal look. 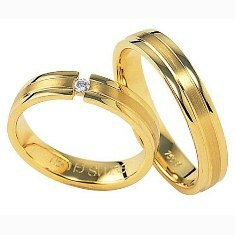 To appear charming, designer bridal gents’ rings are favored. These have intricate designs and are heavy and weighty. Gents’ rings would have a single precious stone embedded in the precious metal. Grooms prefer to wear yellow gold during Indian weddings. The luster of yellow gold outshines white gold, silver or platinum and gives the groom a rich look, hence this metal is a favorite for gents’ jewelry. Glittery Indian bridal gents’ rings are necessary if the groom’s outfit is the traditional kurta – a long shirt matched with linen or silk pants. The shirt has a high collar and long sleeves. Grooms would also wear a shawl called a dupatta that would be draped around their necks. To complement this striking attire, gents’ rings should stand out and have precious gems such as rubies or South Sea pearls. Diamonds are alluring gems on rings as are emeralds and sapphires. Most gents’ rings look trendy and fashionable with their bracelets and watches. Indian bridal gents’ rings are a necessary accompanist for grooms on their wedding day. Expensive complements to their stunning attire, gents’ rings should be in yellow gold with precious stones to make the groom look truly excellent. The traditional Indian gents’ wedding outfits are heightened in their splendor when accessorized with spectacular designer rings.